[Editor’s note: Since 1998, when BRCA 1 and 2 (sometimes referred to as the ‘breast cancer genes’) were first patented, Breast Cancer Action has maintained that the patenting of human genes interferes with patients’ access to genetic testing and medical care. In 2009, BCAction joined the ACLU in litigation challenging the rights of Myriad Genetics to own these patents. We were–and remain–the only breast cancer organization named as a plaintiff in this suit. On March 29, 2010, district court Judge Sweet issued a ruling that invalidated certain of Myriad Genetics’ patents related to the BRCA 1 and 2 breast and ovarian cancer susceptibility genes. Myriad Genetics appealed this decision. Later this June or July the Federal Court of Appeals will issue a decision on Myriad’s appeal. Regardless of who wins or loses at this stage, the case won’t end here. We invited several key partners on this issue to address the implications for women in the United States and internationally of this lawsuit and the pending decision. However, regardless of this ruling many speculate that legislation will inevitably follow. The international community is watching eagerly to see the results of this legal challenge]. Gene patenting is a highly profitable business. Over 20 percent of the human genome is patented, including the gene for breast cancer. Throughout the United States and abroad, these patents directly impact patient health care by placing limits on gene research and testing. By granting these gene patents, the U.S. Patent Office has put corporate profits before the health and well-being of patients, and the time has come to stop this practice. The gene patents problem moved to the forefront of public debate because of a lawsuit challenging patents on two genes that correlate with increased risk for breast cancer and ovarian cancer (BRCA1 and BRCA2). Breast Cancer Action, along with the Association of Molecular Pathology, the American Civil Liberties Union, and other patients and researchers sued Myriad Genetics and the U.S. Patent Office in 2007, arguing that genes are not patentable since they are facts of nature. Myriad Genetics, which controls the patent and charges women over $3,000 for a test, sent cease-and-desist letters to other researchers looking at the BRCA1/2 genes. Myriad will not let other companies test for the genes and thus prevents women from getting a second opinion. Myriad’s high charge keeps some payers from approving the tests. Gene patents have a detrimental impact on health care and research. Gene patent holders often use their exclusive control to charge excessive fees for diagnostic testing and prevent other researchers from utilizing the specific gene for further research. Gene patents can prevent more accurate, affordable, and complex diagnostic tests from being developed. Recent research suggests that dozens or even hundreds of genes may be involved in diseases like Alzheimer’s. When researchers cannot get permission from the patent holder to perform research on a gene that contributes to the disease they are working on, progress is delayed. Possessing a gene for a disease does not mean a person will develop the disease. Most genetic tests offer only an estimate of the chances for developing a particular disease and fail to account for the influence of other genes and environmental factors. The predictive power of the test for BRCA breast cancer mutations is high for persons from families with a history of particular kinds of breast or ovarian cancer but very low for women without a family history of breast cancer. In fact, many women who test positive for a BRCA1 mutation do not get the disease. The patenting of genes drives research toward looking for gene-to-disease correlations and away from environmental and other factors that also lead to increased risk of disease. Environmental factors, such as chemical exposure, play a major role in breast cancer. 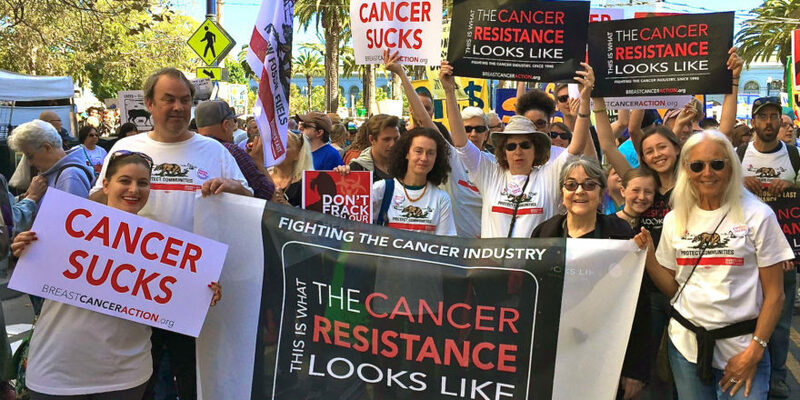 One cannot patent and profit from identifying a chemical’s link to increased risk for breast cancer, but you can patent a gene sequence and profit by charging exorbitant fees to test families of persons with breast cancer to see if they have the gene that your test links to the disease. The plaintiffs won the first round when the district court agreed that genes are facts of nature and not patentable. The case was then heard by the Federal Court of Appeals, whose decision — expected this summer — will likely be appealed to the U.S. Supreme Court. This appeals court usually sides with patent holders, so we must prepare to continue fighting for an end to gene patenting. If the Supreme Court declines to hear the case or rules against the plaintiffs, we will need action by Congress to keep more genes from being patented. A bill in Congress would ban the patenting of all naturally occurring genes and DNA sequences. Rep. Xavier Becerra (D-CA) and Rep. David Weldon (R-FL) are about to reintroduce the Genomic Research and Accessibility Act, which they first introduced in 2007. This bill ensures an end to further patents on our genes and DNA, and assures equal and fair access to genetic tests and medicines. The law would not take back patents already granted, but the Genomic Research and Accessibility Act would be an important step, along with victories in the courts (which can determine that certain gene patents, like the BRCA1 & BRCA2 patents, are invalid). 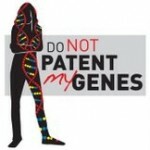 Together a court victory and legislation would bring an end to the patenting of our genes. Women’s health activists play a crucial role in the fight to end gene patenting. The breast cancer gene patent lawsuit was the first legal victory in the fight to end human gene patenting and helped educate the public and policymakers on the issue. Call your members of Congress today, and tell them to cosponsor the Genomic Research and Accessibility Act, which Rep. Becerra will reintroduce. It’s hard to imagine how and why it happened, but it did. Myriad Genetics has the exclusive legal rights over usage of the human genetic mutations that are linked to familial breast and ovarian cancers in the United States and many other countries. In June or July 2011, the Federal Court of Appeals will rule on whether the U.S. Patent and Trademark Office got it right when it granted Myriad such a patent over something none of its scientists invented. This is a very important ruling, not only for American women but for women around the world. The Myriad case is not just about patent law. It’s about the future of medical and scientific research. And it’s about a right we all should possess regarding the ability to control who does what with our bodies. Despite President Bill Clinton and British Prime Minister Tony Blair declaring that the human genome was to be made freely available, more than half of the genes discovered have become the subject of privately owned intellectual property rights. Patents have been granted over many, many human genes and proteins, the unique structures that make us what and who we are. This ruling in June or July will clarify the legal position and, hopefully, in upholding the decision of Judge Sweet of the district court, will send shockwaves around the world. We all want better and cheaper diagnostics, drugs, treatments, and cures for cancers and other diseases and, while the patent system plays a role in driving medical innovation, it is only one of many things that do. Publicly funded research also plays a crucial role. It was Mary-Clair King and her team, who labored for 16 years at UCSF, who discovered the link between breast cancer and the BRCA1 gene on human chromosome 17q. Myriad’s scientists, who had access to the medical history of thousands of Utah women, information which these women freely provided to the University of Utah, were then able to use this information, together with King’s discovery, to identify some of the key genetic mutations. But does that give Myriad the right to say it invented the BRCA gene mutations? More to the point, does it give Myriad the right to exclude other clinicians and scientists that want to utilize the genetic mutations to develop cheaper and more accurate diagnostic tests? In Australia, Myriad’s patent partner, Genetic Technologies, tried to use Myriad’s Australian patents over BRCA to close down all of the laboratories that had been performing BRCA genetic testing (apparently without Myriad’s permission). The attempt failed, but only because of the enormous public outcry that led to a full-scale Senate inquiry. During that inquiry, Australian scientists gave evidence of how they were denied the ability to conduct BRCA research for two years because Myriad and its Australian partner couldn’t work out who had the right to authorize the research. Finally, they got permission, but in the meantime, the cost of the research had tripled. The pending Federal Court of Appeals decision will hopefully clear the road of these kinds of patent land mines, which only cripple the doctors and scientists that are seeking medical and scientific advancement for the benefit of all humankind. Sure, let’s reward real ingenuity and invention with a patent, but let’s also keep genes and proteins, things no one invented, out there for doctors and scientists to access and use so that private interests can’t hinder them as they travel down the medical research road to give us better and cheaper diagnostics, drugs, treatments, and hopefully, cures. Kyle Jensen & Fiona Murray, Intellectual Property Landscape of the Human Genome, 310 Science 239 ( 2005); see also, Human International Genome Sequencing Consortium, Initial Sequencing and Analysis of the Human Genome, 409 Nature 860-921 (2001); J. Craig Venter et al., The Sequence of the Human Genome, 291 Science 1304-1351 (2001). See Jon F. Merz, Antigone G. Kriss, Debra G. B. Leonard, & Mildred K. Cho, Diagnostic Testing Fails the Test, 415 Nature 577-579 (2002); David Blumenthal et al., University-Industry Research Relationships in Biotechnology, 232 Science 1361, 1362 (1986); David Blumenthal et al., Withholding Research Results in Academic Life Sciences, 277 JAMA 1224, (1997); David Blumenthal et al., Data Withholding in Academic Genetics, 287 JAMA 473, 477 (2002). M.K. Cho, Preparing for the Millennium: Laboratory Medicine in the 21st Century, 47-58 (AACC Press, 2d ed. 1998). Michael J. Malinowski & Robin J.R. Blatt, Commercialization of Genetic Testing Services: The FDA, Market Forces, and Biological Tarot Cards, 71 Tul. L. Rev. 1211 (1997). Wylie Burke, Genetic Testing, 347 N.E.J.M.1867, 1872 (2002). See Shimizu T, Ross RK, Bernstein L, et al, Cancer of the prostate and breast among Japanese and white immigrants in Los Angeles County. Br J Cancer. 1991;63:963-966; Lichtenstein, Paul, et al,. Environmental and heritable factors in the causation of cancer: analyses of cohorts of twins from Sweden, Denmark, and Finland. New England Journal of Medicine, Vol. 343, July 13, 2000, pp. 78-85. The suit against Myriad came about after many years of hard work and owes much thanks to the foresight, dedication, and determination of Tania Simoncelli, a former scientific advisor at the ACLU, who first raised the issue with the ACLU, as well as to Chris Hanson and Sandra Park, ACLU attorneys. © 2011, Breast Cancer Action ISSN #1993-2408, published quarterly by BCAction. Articles on detection and treatment do not constitute endorsements or medical advice but are intended solely to inform. Requested annual donation is $50, but no one is refused for lack of funds. “Breast Cancer Action,” “Think Before You Pink,” and the BCAction logo are the registered trademarks of Breast Cancer Action. All rights reserved. Not to be used without express written permission. ← Promise me you’ll read the ingredients on this pink perfume! I’m curious why the patent office approved the patenting of the gene itself, rather than the test Myriad devised to identify the gene. I am assuming this is the crux of the problem, that the federal government should only have ability to patent an idea/product, etc., invented by a human being and not be able to patent something created by nature. Is this the logic lawyers are using to fight the case? Great questions, Janine. It’s all about the money. The Patent office started granting patents on DNA in the 1980s since they believed “isolated DNA” was an invention (and of course the Biotech industry pushed hard for this). The crux of our argument is that DNA and genes, whether isolated from the body or not, are facts of nature and are not patentable. Patents are for inventions and no one invented our collective human genome or its mutations. Let Myriad, for example, patent its test but don’t lock the genome up so no one else can come up with a more effective or potentially more affordable test. Medical advances should be considered as non- business profession. Else humanity suffers! Everyone who could benefit from specific information about possible gene mutations they may carry and making the best treatment decisions possible – should be allowed access to this testing from multiple sources, at reasonable prices, and in ways that are affordable to everyone.